Alexandra Palace Bar & Kitchen, London, N22 7AY. 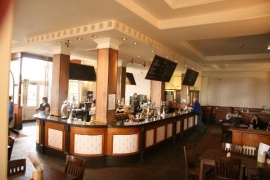 Alexandra Palace Bar & Kitchen pub review, map and rating. Looking for a Hotel near Alexandra Palace Bar & Kitchen? The 'Bar and Kitchen' inside Alexandra Palace appears to be taking itself a bit more seriously these days. Not having visited for a while due to the dirty and sticky feeling you got just standing in the bar area, several improvements have taken place. The food was good, the staff were pleasant and helpful, the wine was nice and cold and we were comfortable in a nice big leather sofa. Well done Ally Pally!